Workers construct Ryan Fieldhouse to the north of Henry Crown Sports Pavilion. The facility will feature training rooms, offices and an indoor practice field. In a couple of years, Northwestern football players will be running drills against the scenic backdrop of Lake Michigan in one of the nation’s most expensive practice facilities. The $260 million Ryan Fieldhouse and adjoining Walter Athletics Center, due to be completed in summer 2018, will abut the north wall of Henry Crown Sports Pavilion and feature training facilities, office space and an indoor practice field offering sweeping views of the lake. 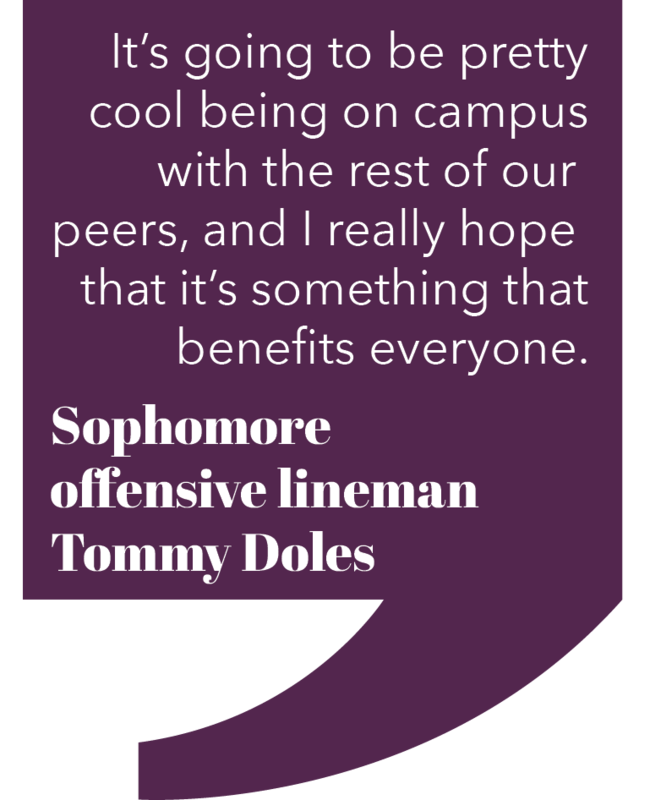 For the football team, the future fieldhouse is a means to lure better recruits to a program that has historically struggled. For the University, the lakefront facility is one of the most visible construction projects funded by the $3.75 billion “We Will” campaign. As the most expensive practice facility in the Big Ten, few, if any, projects compare to the size and scope of NU’s new lakefront complex, and the new buildings will allow athletes to practice on campus rather than 1.5 miles to the west near Ryan Field. The next-most expensive practice facilities project in the conference is unfolding at the University of Minnesota, which announced a $190 million plan in 2013. Beyond just football or varsity athletics, NU administrators have suggested the university’s facility will be a multi-use venue that benefits all students on campus. But not everyone shares Schapiro’s enthusiasm. The student protest at the Ryan Fieldhouse groundbreaking one year ago is indicative of the frustrations some students have with how the University allocates its resources. About 300 students disrupted the Nov. 13 groundbreaking to protest in solidarity with black students at the University of Missouri and Yale University and to make demands of the assembled administrators and donors. Although the demonstration centered on institutional racism — not the construction project itself — Weinberg senior Marcel Hanna, who participated in the protest, told The Daily the choice to demonstrate at the athletic facility was deliberate. The investment has already been made, but it remains uncertain whether Ryan Fieldhouse can deliver on expectations to improve the fortunes of the football team and act as the community-builder administrators envision. Football is now a vital part of the university’s athletic structure despite the team’s mixed and occasionally-sordid track record over the past 45 years. The program bottomed out at the start of the 1980s, suffering through a 34-game losing streak that still stands as the longest ever in major-college football history. In the midst of that futility, some University officials even flirted with moving NU out of the Big Ten, a conference it took part in founding, and into the lower-tier Ivy League. It was a far cry from the team’s heyday in 1949 when NU won the Rose Bowl. But NU stayed in the Big Ten and ultimately rebounded, returning to the Rose Bowl after the 1995 season and maintaining respectability throughout the current tenure of coach Pat Fitzgerald. NU has also reaped the rewards of ever-more-lucrative broadcast rights deals that have left the entire sport flush with cash and given NU broader national exposure. And as the stakes for football money and players have grown, so too has investment in the sport. In a race to attract recruits, many schools have begun to compete over who can build the best facilities. 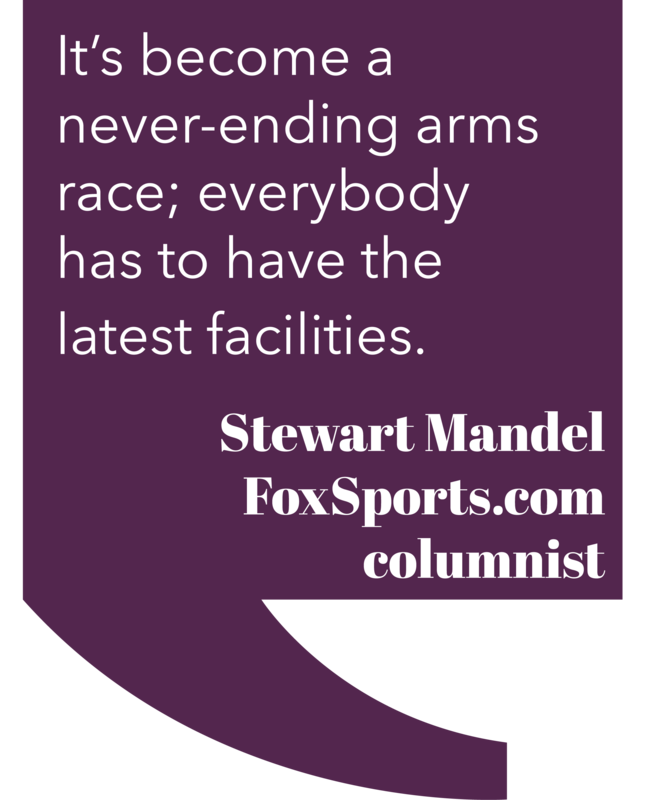 Stewart Mandel (Medill ‘98), a senior columnist for FoxSports.com and former Daily staffer, has witnessed this ongoing competition first-hand. College football today is a big-money endeavor, especially for the elite in the sport. According to a USA Today analysis, the athletic departments of Michigan and Ohio State — two flagship programs in the Big Ten — each brought in more than $150 million in revenue in fiscal year 2014-15. More than half came from football. NU’s athletic department works on a much smaller scale. According to Department of Education filings, the Cats’ football program brought in $31.7 million in fiscal year 2014-15, leaving over $10 million in profit. The money brought in by college football programs is often siphoned away to subsidize other athletic programs, so schools usually turn to donors to pay the tab for new facilities. Perhaps the best example of big sports spending is the University of Oregon, which opened a $138 million football performance center in 2013. The glamorous facility has not yet improved Oregon’s ability to draw top recruits. According to 247sports.com, the Ducks’ recruiting classes in the three years prior to the facility opening ranked, on average, higher than their recruiting classes in the three years since. But Northwestern has more room for improvement than Oregon. Working against the Cats is their position as a program where academic fit — and not facilities — matters most to many prospective recruits. Moten’s response aligned with those of four other players interviewed by The Daily, who, while excited about the prospect of practicing on Lake Michigan, did not cite the Ryan Fieldhouse project or other athletic facilities as factors affecting their recruiting decisions. The closest historical proxy for the Ryan Fieldhouse project likewise offers discouraging evidence. In 1996 and 1997 NU renovated Dyche Stadium — renaming it Ryan Field — and constructed Trienens Hall, an indoor practice facility. The Cats won just 11 games over the next three seasons. The Chicago skyline rises beyond Hutcheson Field, a new outdoor practice field constructed this year. 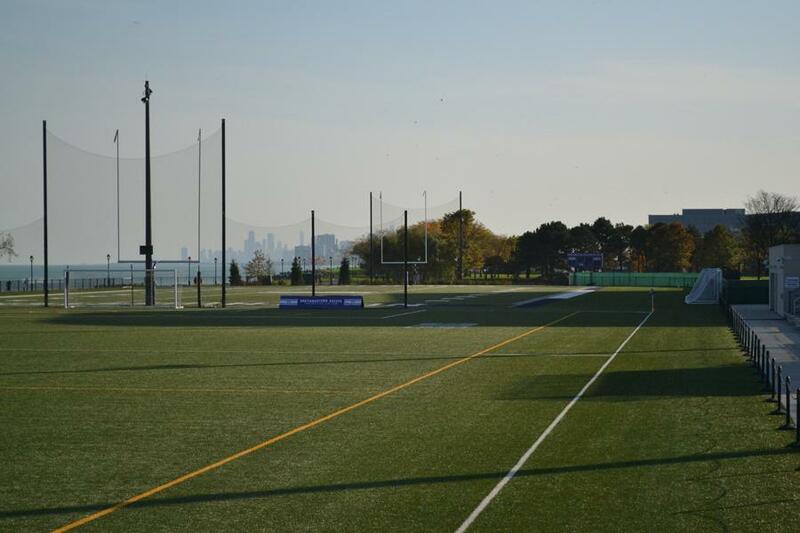 Northwestern has invested significantly in lakeside athletic facilities since the start of the $3.75 billion “We Will” campaign. Rather than any one amenity of the building itself, the most important feature of Ryan Fieldhouse is likely its location. Nestled into the northeast corner of NU, Ryan Fieldhouse is significantly closer to the classes and residences of most athletes than the Ryan Field complex. 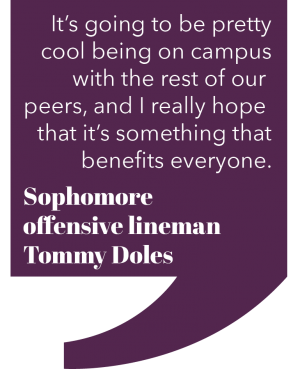 For sophomore lineman Tommy Doles, who represents student athletes in Associated Student Government Senate, this proximity is key to enhancing the athlete experience at NU. That benefit to athletes isn’t just for football players. All 19 of NU’s varsity teams will utilize Ryan Fieldhouse and Walter Athletics Center, and the indoor field can also serve as a competition venue for soccer and lacrosse, athletic department spokesman Paul Kennedy told The Daily in an email, though specific plans have not yet been finalized. 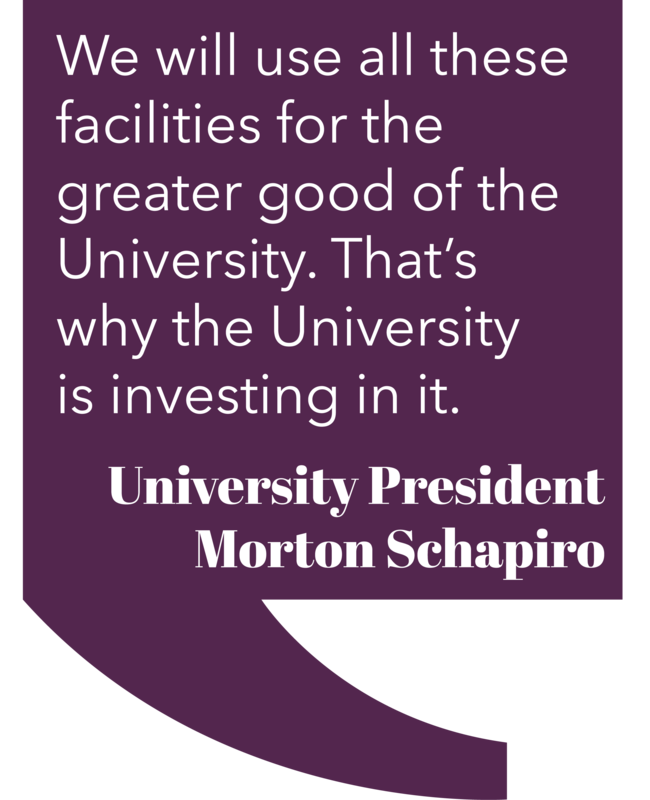 In addition to bringing athletes closer to the rest of the Evanston campus community, Schapiro has stressed the multipurpose nature of the facility. Ryan Fieldhouse, he said, is a large and enclosed venue that can be utilized for major campus events. 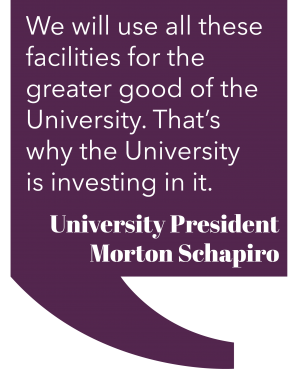 The biggest potential use of the fieldhouse is Northwestern Dance Marathon, which Schapiro and athletic director Jim Phillips expect to move from its current location on the Norris East Lawn once the fieldhouse is complete. Dance Marathon has not finalized plans to move its annual Winter Quarter fundraiser, executive co-chairs Jenny Halpern and Ian Pappas told The Daily in an email. Last year, former executive co-chair Arielle Miller (Medill ‘16) told The Daily that hosting Dance Marathon in Ryan Fieldhouse would lower costs of the 30-hour event and would decrease the registration fee for dancers. Weinberg senior Isaac Rappoport, ASG’s chief of staff, told The Daily he expects ASG to advocate for the facility to be used by more groups than just Dance Marathon. “As the primary representatives for undergraduate students on campus, we’re always going to push for more access to the average undergrad,” Rappoport said. 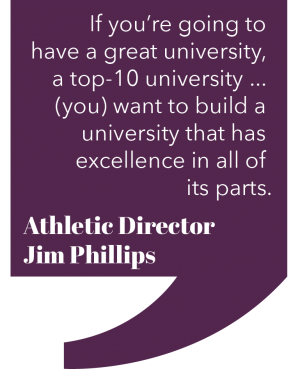 Rappoport added that moving student-athletes closer to campus is a problem worth solving, but questioned whether the $260 million cost of Ryan Fieldhouse was the best way to address that concern. Students who make frequent use of campus recreational facilities are hopeful that the benefits of Ryan Fieldhouse will extend to them as well. Weinberg senior Demo Drakoulis, who told The Daily he plays pickup soccer two to three times per week, expressed frustration over the lack of a dedicated field for recreation at NU. Drakoulis added it can be difficult for pickup soccer players to navigate the scheduling of NU’s existing varsity athletic fields, though he said his experience using them was positive overall despite occasionally being kicked off to accommodate a varsity team. Phillips did not address specific plans for how Ryan Fieldhouse might be used recreationally by students, but pointed out that other facilities, such as the recently-constructed Hutcheson Field, are frequently used by students and club sports teams. He also expressed a desire to renovate Long Field for student use in the near future. But for students like Hanna, who participated in the November 2015 protest, the benefit to recreation Ryan Fieldhouse may provide to students doesn’t mean much in the face of more pressing issues. He noted that most of the demands from the protest last year have still not been met. Those demands include bettering mental health resources on campus and remodeling the Black House and Multicultural Center, which became the focus of student activism after administrators attempted to consolidate office space there. Last spring, the University drew praise for eliminating the 12-session limit at Counseling and Psychological Services. But earlier this fall, students criticized administrators’ decision to remove long-term counseling at the Women’s Center and redirect its mental health services to CAPS. For Phillips, the cost of the project is simply a function of the funds available to him. He told The Daily all the money for the fieldhouse project came from outside donations to athletics and not university resources. 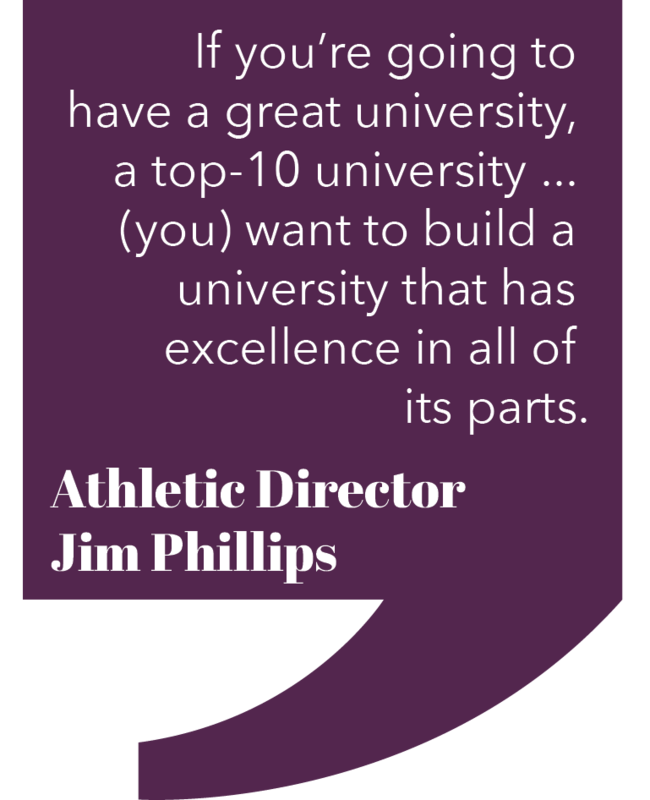 Phillips added that he feels he has an obligation to student-athletes to use that money to build the best facilities.